The principle of this group is to for members to experiment with new ideas and then share their experience with their colleagues and the wider teaching community. We draw on various resources on rotation. The aim is to celebrate and share approaches that can be used by staff in a variety of subjects easily within day-to-day teaching. My task for term one was to focus on feedback, drawing on websites as a resource. I decided to experiment with my A2 Sports Psychology group. These students struggle with long answer responses and, as a result, their drive to improve their performance in this area can dip due to a lack in confidence; some feel that reaching higher grades is just not possible for them. When I have marked these responses in the past I have often found misconceptions in one or two aspects which have a significant impact on their final grade. Motivating this group to respond to my feedback independently is not easy. I feel this process is essential and I had been looking for a simple way to motivate them to do so. During my research I found a post on www.teachertoolkit.com called ‘The Yellow Box’, which had been taken from The George Spencer Academy. Employing this strategy allows the teacher to mark a section of work in great detail, highlight that to the student via the yellow box. Feedback is then provided, focusing on the work in the yellow box only. The hope is the guidance given will have a positive impact on the entire piece of work without the teacher having to mark to entire piece in detail. I have employed this method in a different way to meet the needs of my group. I have been marking the entire long answer questions as per normal. Instead of asking students to re-write or apply my feedback to the entire response which can be demotivating for a student who struggled to complete the work in the first instance; they only re-write the work highlighted in the yellow box in response to my feedback. Students approach responding to my feedback more readily, they are learning to identify areas within long answer questions that have a significantly negative impact on the entire piece and the work they produce in response to my feedback is focused on quality not quantity. This also saves me time when remarking work; in most cases the work in the yellow box that has been re- written by the students increases the grade of the piece, and also increases the confidence of my students when approaching a difficult aspect of assessment in this course. 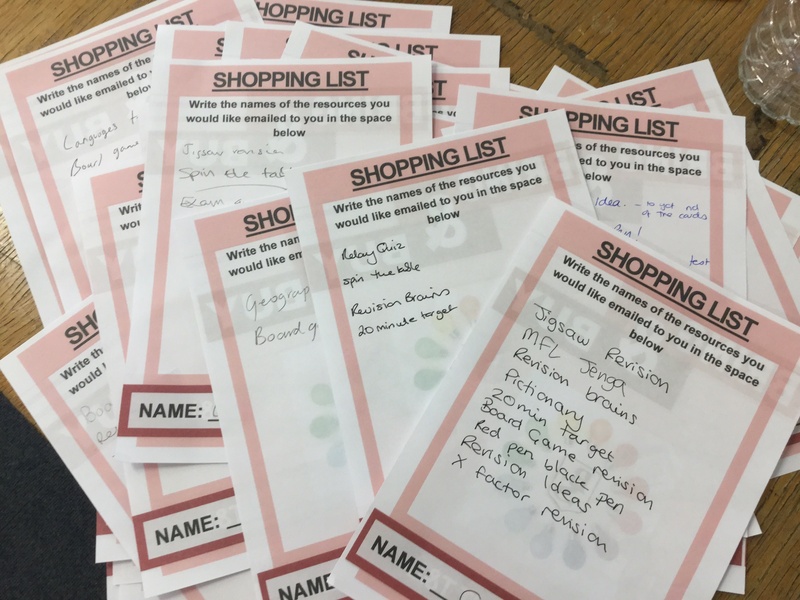 Over the next few weeks other members of Nat’s focus group will feedback on everyday ideas that they have tried and tested. Keep checking back for more ideas! I am a much happier soul when I am working with others. Sharing my thoughts and listening to the much better ideas other people have. At the right time it can be an unbelievably useful teaching strategy but group work still scares people. Do not be afraid – get involved. Group work can be the most rewarding yet stressful of activities for teachers and students alike. Teachers can worry about classroom management and the activity being ‘worth it’. Students can be concerned about who they will work with and what they will be asked to do. As a Drama teacher this is my bread and butter, the most essential part of my planning to ensure the best outcomes for my students. Over the years I have observed a lot of lessons in all subject areas and developed my own practice so that I do the right thing at the right time. So here are a few of my top tips for group work. Until you are confident that you know and understand the class do not let them choose who they work with. You can destroy the self-esteem of the student who is left out. Decide what you want out of the task and then select the groups so that you get the outcome you want. Allocate roles and expect every child to play an active part in the group task. Use different methods to put students into groups so that it is interesting – jigsaws, lolly sticks, birthdays, numbers, ability, gender. Think about it and don’t leave it to the last minute to make your decisions. 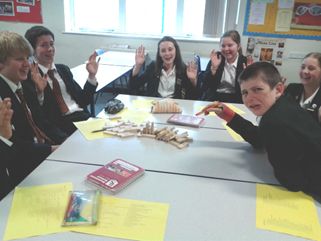 I had seen pictures on Twitter of people using Jenga in Languages lessons and thought it would be a fun thing to do. Having raided the toy cupboard at home for the Jenga set, I wrote a number on each of the blocks in permanent marker. Next, I prepared a numbered sheet of questions (54) to revise some of the vocabulary and structures my class needed to work on. 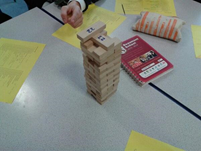 As pupils came in and realised they would be playing Jenga, they were very excited and I was slightly concerned at how much learning would happen. However, I needn’t have worried. If anything, behaviour was better than usual as they were highly motivated and were fixated on the Jenga game so were less likely to become distracted. Each time someone removed a block, they had to find the question which had the same number and answer it. The level of peer support was very high as pupils wanted to get on with the game, so everyone tried to help in getting the answer right. In conclusion, everyone was happy. There was very little preparation for me. The students were motivated and therefore had a go at more difficult questions than they would otherwise have done in a traditional lesson. I am going to buy a few more sets of this so that a whole class can play at once!